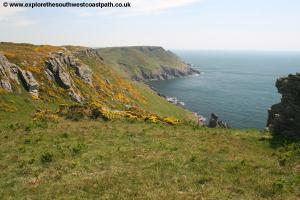 This walk takes in some of the most beautiful and remote countryside of the South West Coast path through the unpopulated and unspoilt South Hams area. 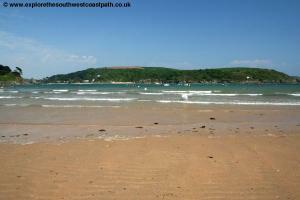 There are numerous good sandy beaches on the route and it finishes in the popular yachting spot of Salcombe. The walk begins from Outer Hope. From the A381 between Kingsbridge and Salcombe take the road into Malborough and head for the church. At the church fork right for Galmpton and Outer Hope. Note that this road is a single track for most of the route after the A381. There is a pay and display car park in Outer Hope just near the sea. 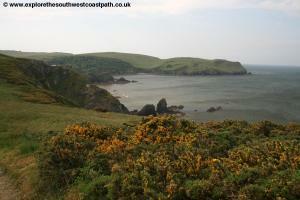 Keep on the main road, Hope By-pass until you reach the coast and you should then see the car park. 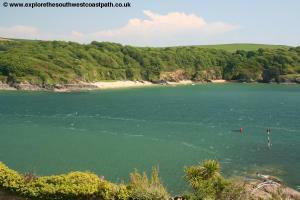 Alternatively you may prefer to park in Malborough on the A381 roughly halfway between Kingsbridge and Salcombe and then take the bus at the start of the walk (which does not run often, see below) and then the bus back to Malborough at the end of the walk (this route is more frequent). As there is no direct bus back to Outer Hope from the end of the walk, you have to change buses in Malborough and the connections are poor, so this may work better. There is a small car park in Malborough by the post office but you will be lucky to find a space. If there is no space you will need to park on street. If so please park with consideration for local residents and avoid blocking any access. This is a difficult walk by public transport as routes are so limited. To get to Outer Hope Tally Ho Coaches service 162 runs only 3 times a day from Kingsbridge to Outer Hope. At Kingsbridge there are bus connections to Dartmouth and Plymouth on First Devon and Cornwall service 93 and Totnes on Tally Ho Coaches service 164. Service 164 serves Totnes railway station if you are travelling by train and there is also a station in Plymouth, but you will need to walk or use a local bus to get between the station and city centre. There is only limited accommodation at Outer Hope and Inner Hope as they are small villages. 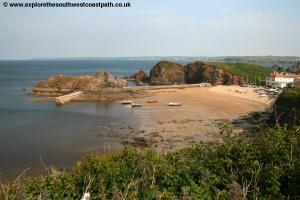 However there are a couple of hotels, The Cottage Hotel Hope and The Sun Bay Hotel, Hope Cove. There are also a couple of campsites close by, Bolberry House Farm Campsite and Karrageen Campsite. 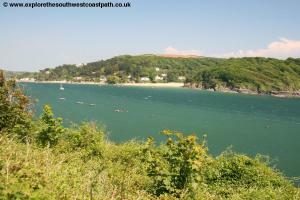 There is a much wider choice of accommodation in and around Salcombe at the end of the walk. 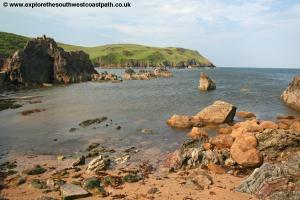 Outer Hope is the northern of these two twin villages which have a small sand and rocky beach. From Outer Hope and the car park head south along the road past the row of cottages on the right to the slip way at Hope Cove. 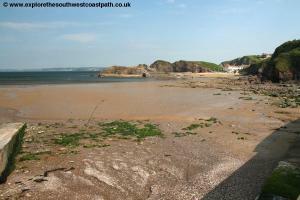 This is the better of the two beaches and is beautifully unspoilt especially at the south with woodland around the south edge of the bay. After the slipway the coast path continues over the grass. 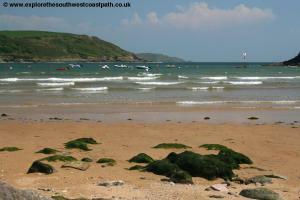 This then meets the road again and you continue south along the road to the south end of the beach. 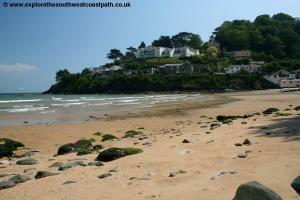 At the end of the beach you should see the coast path going up steps away from the beach towards a house. This heads through a small area of woodland and then emerges onto the headland of Bolt Tail. 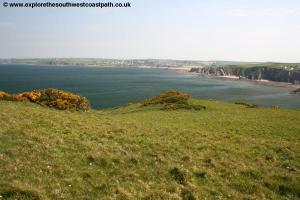 The cuts off the end of the headland, but there is another footpath that does go right out to the end of the headland, which is recommended. 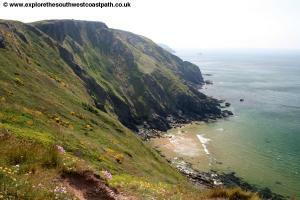 From here the coastpath is very easy to follow just keep to the good cliff top path over these low cliffs. The sea is very shallow here and soon you will see the sandy beach of Hughs Hole below, although there is no access from the cliffs to the beach. 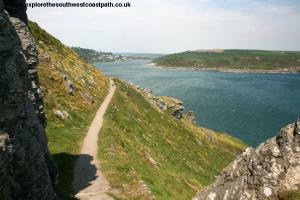 The path then climbs onto Bolberry Down and goes right along the clifftop. 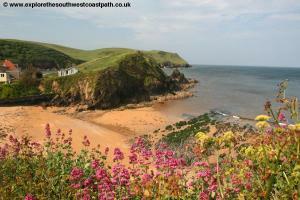 You have good views both along the coast and back to Hope Cove. 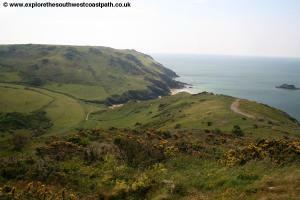 Soon the path reaches a minor road and car park but you keep straight on here right along the cliff top again. 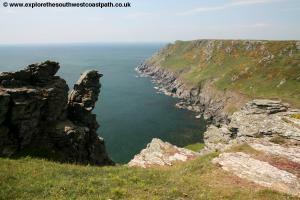 The cliffs are higher now and the coast path keeps right to the tops of the cliffs with views all along the coast ahead. 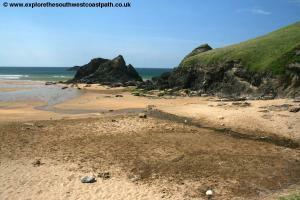 Soon if the tide is low you will see sand ahead and the path then descends down to this small beach, Soar Mill Cove. This is one of my favourite beaches on the South Devon coast, as it is secluded and completely unspoilt, no buildings are visible from the beach. The poor access also means it is rarely crowded as the nearest car park is around half a mile away. 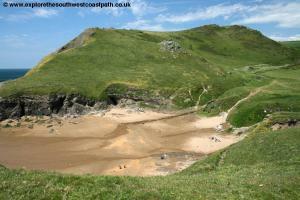 You may wish to descend down to the beach as there is a good path down. 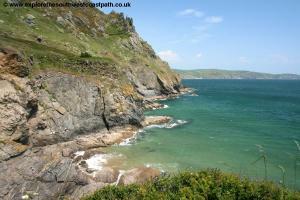 If not just continue on the coast path along the valley at the back of the beach. 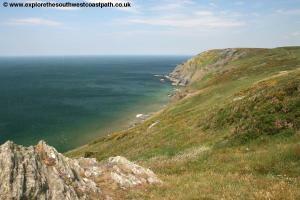 You cross a little stream via a footbridge and then climb up back onto the clifftops at the other side. 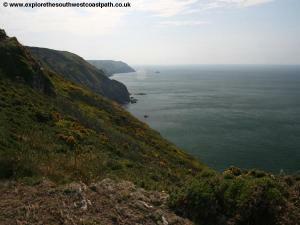 You get a wonderful view back down to Soar Mill Cove here. 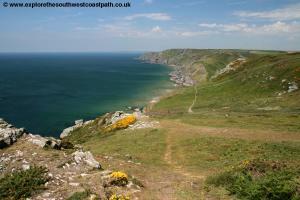 The coast path then reaches the top of the cliffs and continues along the gently undulating cliffs with wonderful views of the coast ahead. 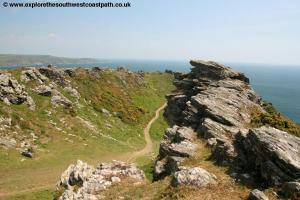 As you near Bolt Head the coast becomes very rugged and rocky and is reminiscent of the North Cornwall coast. 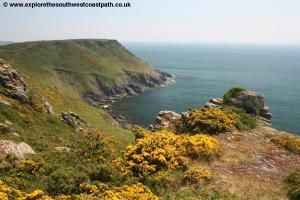 It is beautiful with the grey rocks mixed in with the yellow gorse. 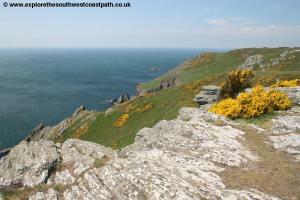 The view from the top is particularly impressive with the rugged rocks providing a wonderful back west along the coast. As you round the end you have a view down the valley ahead and the path ahead is very obvious. 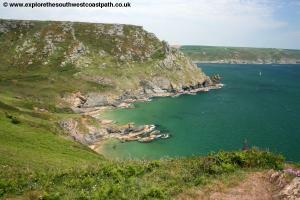 Here you must descend more or less to sea level at Starehole Bay. 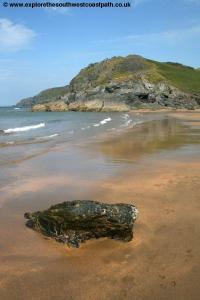 There is a small sandy beach here owned by the National Trust. 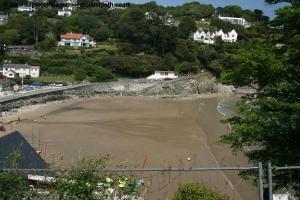 At the time of writing the steps down to the beach are closed but hopefully they will have been repaired soon. 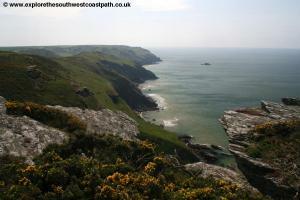 The path then climbs up steeply away from the cove and is especially spectacular running roughly midway up the cliffs on a rocky path around the craggy cliffs. Soon you reach a view point and have a wonderful view all along the river up to Salcombe with the town clearly visible ahead. 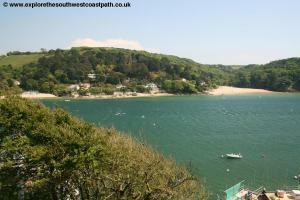 You head briefly through woodland and then emerge onto roads about South Sands beach, one of the best beaches in the town. The path heads down to the beach. Unusually due to the lack of parking here there is a ferry service from the beach to the town centre, but as there is no jetty in the beach it is an unusual system where the boat stops a little out to sea and a sea tractor then drives out to meet the boat. 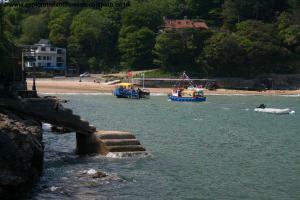 Passengers transfer onto this and out onto the beach and you may see this in operation. Unfortunately the rest of the walk is along roads and although minor roads they carry quite a lot of traffic heading for the beaches in the summer, so care is needed. 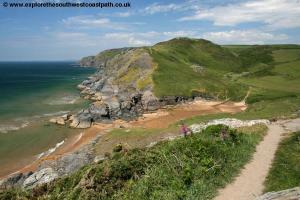 The road winds up the cliffs and through woodland and then descends down to the second beach, North Sands. 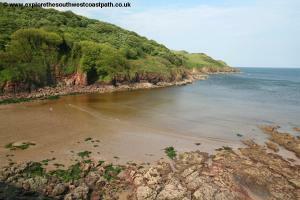 This is another fine sandy beach with fine views over the river to East Portlemouth which has several good beaches. 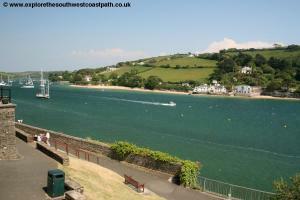 There is a ferry from Salcombe to East Portlemouth. Again take the road up from the beach, Cliff Road and follow this past the woodland with lovely views over the estuary and the sandy beaches on the other bank. This area is very sheltered being in a deep valley and facing south which means you see more tropical plants here than in other parts of the coast and also makes it a very desirable (and expensive) place to live. A stone arch goes over the road at one point. You pass a little view point and gardens on the right and then soon reach the landing point for the East Portlemouth ferry. This is the official end of the walk as the coast path crosses via this ferry, but if you keep a little further north you will soon reach the town centre. To reach the bus stop keep ahead along Fore Street to reach Clifton Place. Here turn left and then take the first road on the right, Market Street. Follow it round to the left into Church Street and then fork right (ahead) onto Shadycombe Road, which is where the buses stop. 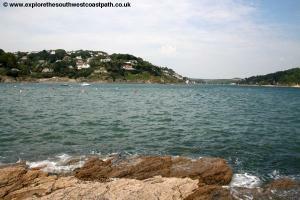 To get back from Salcombe to Outer Hope is tricky because of the poor bus services. From Salcombe Monday – Saturday Tally Ho Coaches service 606 runs hourly to Kingsbridge via Malborough. Tally Ho Coaches service 162 run s 3 times a day Monday – Saturday only from Kingsbridge and Malborough to Outer Hope. This makes connections tricky. If you did not park at Malborough, at the time of writing it is recommended to take the bus at 17:30 from Salcombe to Malborough Garage (arrive 17:45) and depart from Malborough at 18:05 arriving at Outer Hope at 18:13. I am not sure if service 162 stops at the Garage but it does stop at the post office and village shop which is a short way along the main road through the village near the church and post office (there is a small square there) and you will have time to walk between them, since it takes a little over 5 minutes. Note that this is the last bus of the day. On Sundays Stagecoach South West service X64 links Salcombe with Kingsbridge, Totnes, Newton Abbot, Kingsteignton, and Exeter twice a day, but there is no service to Outer Hope, so you would need to take a taxi back. Ordnance Survey Explorer OL20 (South Devon) covers this area and is available from bookshops locally and nationwide as well as on-line retailers. The links below also show the map of the walk.